For Figure 14, he says that "in the case of a constant velocity model, the equal-traveltime contour will be a hyperbolic surface centered over the image point" - my question is this: why is it a hyperbola and not a semi-circle? In John Claerbot's Imaging the Earth's Interior, he claims that the equation of a wave front a given constant time results in a semi-circle and not a hyperbola. In Figure 13, he also says that "in the case of a constant velocity model, the equal traveltime contour will be an elliptical surface with the source and receiver as the two foci" - again, my question is this: why is this an elliptical surface in this particular scenario? Why not a semi-circle? The information you provide is rather limited, however, I want to try and disentangle this. The way I see it, you are mixing three different concepts in your questions. I will work through the semi-circle, through the elliptical towards the hyperbolic assumption. You can stop the gif at any time (drag it with your mouse) and all wavefronts will be concentric. You can also see this, when you look at the wave equation. Changes in time equal the velocity times changes in space. If the velocity is constant, a change in time will cause a equal change of wave propagation in any available direction. While often, we work in (x,y,z)-coordinates, here it's easiest to assume that our wave source is at $(0,0,0)$ and if our propagation is equal in all directions, our vector pointing to these points in space is the radius of a perfect sphere. Of course, if we're looking at a half-space like we do in seismics, we have a half-sphere and if we scale back to 2D we have a semi-circle surrounding our source. So if we dig up a huge patch of subsurface and place receivers all around our source, those equally distant from the source should respond at the same time after igniting the source. In Fig. 13 you see the semi-circle. There are several important things to note in this image. The first would be the receiver. The receiver is off-center, but all those receivers in the semi-circle example are too. 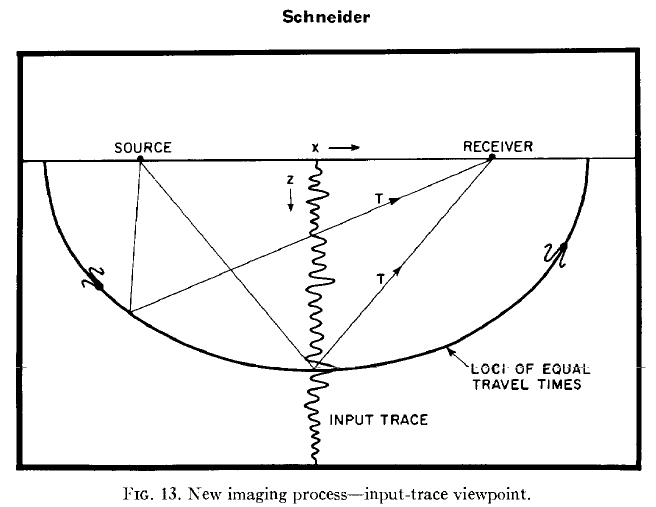 What makes this different, is that instead of several receivers recording the wave simultaneously, here, it's one singular receiver. Additionally, before our source was nice and centric, now it's off-center. Unfortunately, this is not enough to make sense of Fig. 13. Firstly, for the semi-circle we were looking at direct waves. In Fig. 13 we see reflected waves. Now, they assume constant velocity again, which means there clearly must be a density change to make a reflection happen. This brings us to a simple theoretical question: "I have a measurement with the traveltime $T$. Which locations in the subsurface would have to have a density change to explain my measurement of $T$?" 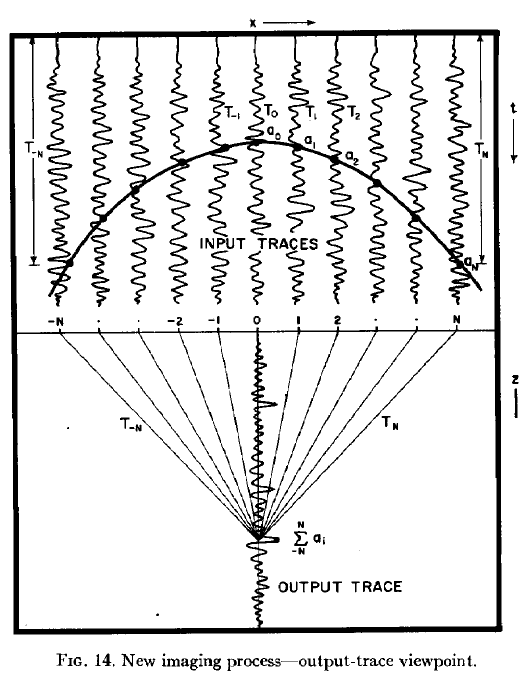 So essentially, you are constructing a plane where the ray path from the source toward the plane, added to the ray path from that incident point on the plane to the receiver is always of the length $T$. Luckily, this is exactly how a half ellipse is formed. You can actually try this with a string. Take a string of the length $T$, fix one end on the source location, one at the receiver location and then put a pen in the sling and trace the outmost location you can reach with the pen in the sling. You have created a surface below your acquisition, which could all have caused a response at your receiver at the time $T$. Figure 14 will again take us a step closer to migration. Before, you looked at One source off-center and one receiver off-center. Now we switch gears again. Let's look at the easiest case here, $x=0$. Here the source and the receiver are at the same location, so the travel time $T_0$ to the imaging point I is equal in length before and after reflection from the subsurface point. But from before we know that this place I could be anywhere on a semi-circle in the subsurface (which would be an ellipse, if it wasn't for the fact the $S=R$, as we saw before). So we need something to convince our math, that instead of placing our image point I "anywhere on a semi-circle", we want the exact location. Here, we have several ways to look at it. If the image point $I$ in the subsurface is actually a point, we call it diffractions. The special property of diffractions is, that they will always reflect your wave right back at you (they diffract the wave, so they scatter the wave in all directions, hence, also back at you). So if you place your source and your receiver at location x=1 in this image, we can construct a triangle between the points $I$, $x=0$ and $x=1$. That means our traveltime T_1 can be calculated with good ol' Pythagoras ($a^2 + b^2 = c^2$): $$1^2 + (T_0/2)^2 = (T_1/2)^2,$$ and we can do this for every point so that: $$T_N = 2 * \sqrt(N^2 + T_0^2/4)$$ and then: $$T_N = T_0 * \sqrt((2N/T_0)^2 + 1)$$ This coincidentally describes the eccentricity of a hyperbola. This is one way to go about finding diffraction hyperbolae, there are several others, but I tried to stick with the provided figures. Not the answer you're looking for? Browse other questions tagged geophysics models seismic or ask your own question. How do I extract seismic amplitude on an interpreted horizon? What is seismic stretch in geophysical method? Does seismic anisotropy follow stratigraphy?